Preliminary research has shown that sodium pentobarbital, a euthanasia drug, can persist up to 180 days in equine mortality compost piles. This experiment attempts to expand upon past research by quantifying pentobarbital residues in equine mortality compost piles over a longer duration using innovative sampling schemes. Six, 3.7 m2 plots were used to construct separate compost bins with 3 bins serving as control. Each bin was constructed with 1.2 m high horse panels. Soil samples were collected in each bin area. The carbonaceous material consisted of wood chips that were added at a depth of 0.46 m creating the base. Twenty-four whiffle balls, pre-filled with wood chips were placed on the center of each pad. Nylon twine was tied to each ball for retrieval. A licensed veterinarian provided six horse carcasses for use in the experiment. These horses had required euthanasia for health reasons. All horses were weighed and then sedated with an intravenous injection of 8 ml of xylazine. After sedation the three horses in the treatment group were euthanized by intravenous injection of 60 ml of sodium pentobarbital. The three control group horses were anesthetized by intravenous injection of 15 ml of ketamine hydrochloride and then humanely euthanized by precise gunshot to the temporal lobe. Following euthanasia, each carcass was placed on the center of the woodchip pad and surrounded with 0.6 m of additional wood chips. Serum and liver samples were immediately obtained while whiffle ball, soil and compost samples were obtained over time. Each sample was analyzed for pentobarbital residues. Compost pile and ambient temperatures were also recorded. Data illustrates pentobarbital persistence up to 367 days in compost piles with no clear trend of concentration reduction. Why Be Concerned with Equine Mortality Management? Equine mortality is an issue encountered by every horse owner. Mortality may be associated with disease, injury, age or a catastrophic event. For horses suffering from an incurable illness or injury, euthanasia is often the most humane option. The American Veterinary Medical Association (AVMA) approved methods for horse euthanasia include barbiturate overdose and captive bolt or gunshot to the temporal lobe (AVMA, 2007). Following mortality, the carcass must be properly disposed of according to local regulations. For many horse owners, carcass disposal options are limited and can be costly. Improper disposal of animal carcasses can present potential environmental, animal and public health risks. Recent interest has focused on the common euthanasia barbiturate, sodium pentobarbital, and its persistence in the animal carcass following euthanasia. In 2003 the FDA added environmental warning labels to euthanasia products containing pentobarbital in regards to proper carcass disposal (FDA, 2003). Barbiturates accumulate within the carcass and can cause sedation or death of animals that may consume the body (AVMA, 2007). Questions exist regarding the potential environmental risk of improperly disposed animal carcasses following euthanasia with pentobarbital. It has been suggested that proper composting of animal carcasses euthanized with pentobarbital may degrade drug residues to negligible concentrations. However, preliminary research has shown that pentobarbital can persist up to 180 days in equine mortality compost piles (Cottle et.al, 2010). The researchers identified a need for controlled experiments investigating the persistence of sodium pentobarbital in animal carcasses during composting. The objectives of this experiment were to expand upon previous research by quantifying pentobarbital residues in equine mortality compost piles over a longer duration using innovative sampling schemes and to determine the efficacy of wood chips as a carbonaceous material for degrading equine carcasses. Six, 3.7 m2 plots were used to construct separate compost bins. Each compost bin was constructed with 6.1 m x 1.2 m metal horse panels supported by 3 steel t-posts. The bulking agent for construction of compost piles consisted of hardwood chips that were wetted to approximately 50% moisture content. Bulking agent was added at a depth of 0.46 m creating the pad. Twenty-four whiffle balls pre-filled with wood chips were centrally placed on each pad. Nylon hay twine was tied to each whiffle ball for retrieval during required sampling times. A licensed veterinarian provided six horse carcasses for use in the experiment. These horses had required euthanasia for health reasons. All horses were weighed and then sedated with an intravenous injection of 8 ml of xylazine. After sedation the three horses in the treatment group were euthanized by intravenous injection of 60 ml of sodium pentobarbital (Beuthanasia-D, Schering-Plough Animal Health). The three control group horses were anesthetized by intravenous injection of 15 ml of ketamine hydrochloride and then humanely euthanized by precise gunshot to the temporal lobe. Compost bin after carcass placement. Following euthanasia, each carcass was placed on the center of the woodchip pad and surrounded with 0.6 m of additional wood chips. Serum and liver samples were immediately obtained while whiffle ball, soil and compost samples were obtained over time. Each sample was analyzed for sodium pentobarbital residues. 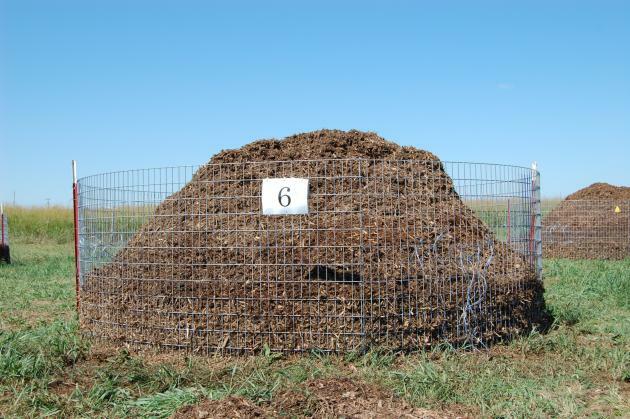 Compost pile and ambient temperatures were also recorded throughout the duration of the study. The findings from this experiment indicate that wood chips were effective at decomposing equine mortalities within 129 days of composting. Nearly all of the soft tissue was completely degraded with only large bones present. 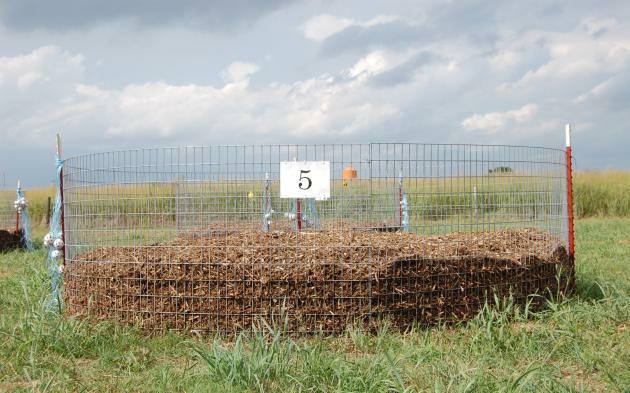 Compost temperatures met EPA class B biosolid standards for pathogen reduction. At day 367, sodium pentobarbital still persisted in the treatment group with no clear trend of concentration reduction from day 7 to day 367. Enveloping the carcass with carbonaceous material and constructing a barrier reduces the risk of secondary toxicosis from scavenging animals. Moreover, carcass degradation by composting followed by homogenous compost mixing allows for dilution of any remaining sodium pentobarbital residues. Future research could focus on alternative livestock mortality management options and their impact on sodium pentobarbital residues. Rodney Farris. Ph.D. Senior Research Station Superintendent. Oklahoma State University. Gene Parker. D.V.M. Area Food/Animal Quality and Health Specialist. Oklahoma State University. Jean Bonhotal. Director. Cornell Waste Management Institute. Mary Schwarz. Extension Support Specialist. Cornell Waste Management Institute. Appreciation is extended to Ted Newell, Tommy Tucker, Robert Havener and Bobby Adams for their assistance with field work as well as Cheryl Ford for her assistance with data entry.